Hora built on the edge of the sharp cliff and the hilltop church of Panagia with the spectacular view. The winding narrow, cobblestone streets of Hora. 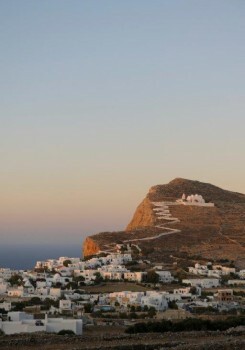 Folegandros is a tiny, white washed gem in the Cyclades chain of islands. When you arrive by boat you meet the main port, Karavostassi, a warm, horse-shoe shaped bay, a few clicks away from Hora. 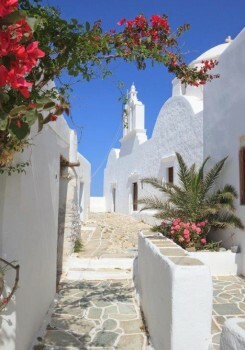 Hora, the name given to all the capital villages in the Cyclades it is built on the edge of a sharp cliff. The village of Hora has been ranked as one of the ‘’seven most beautiful villages in Europe’’ **! The charming houses of the Kato Rouga neighbourhood stand, as if suspended in time. The oldest part of the Hora is a medieval fortified village, Kastro. A quantum walk through a passage to the walled district of Kastro, and you are held captive in the fortified village built by Venetians in the XIII century. The medieval settlement was built to protect the island’s inhabitants from enemy invasions and continues to be inhabited to this day. Some of the houses are over one thousand years old. 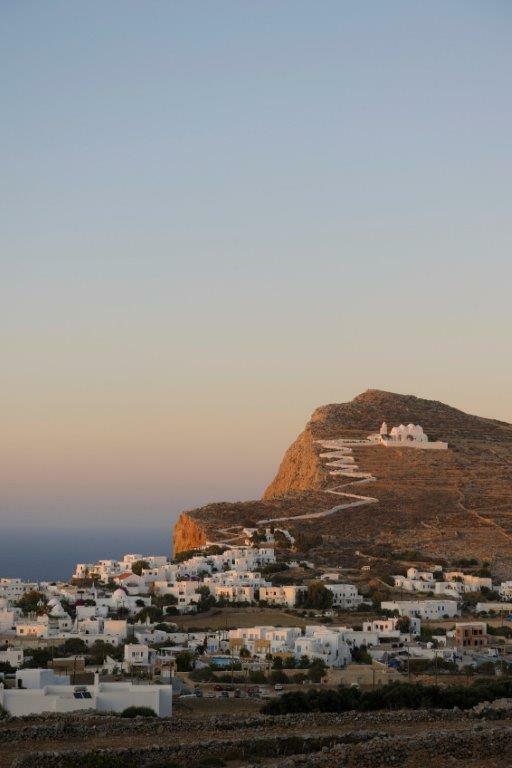 Above Hora, is a striking white, winding path that arrives at a Folegandros landmark, the hilltop church of Panagia, spectacular at sunrise and at sunset. From there you can clearly see the Cycladic islands of Milos, Sifnos and Kimolos. Many more squares with their own churches, and charming houses to explore in Hora. Winding narrow, cobblestone streets and flagstone walkways, always a surprise when you turn a corner. A less strenuous way to circumnavigate the island is a boat tour – the only way to get to Chrysospilia, a cave lined with ancient inscriptions. Drop anchor for a quick dip into the endless blue. 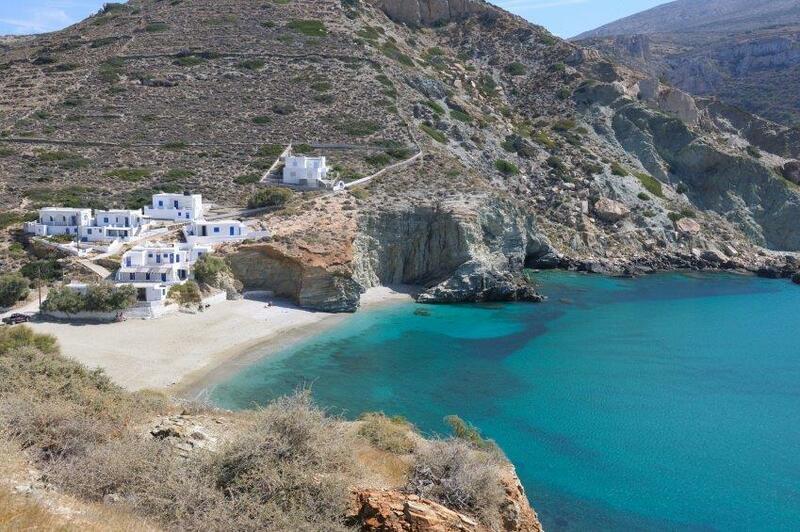 Coastal paths for stunning walks all over Folegandros lead to gorgeous spots for swimming. Whether you walk, take the bus or jump into a caique, you will find endless blue waters lapping its beaches. Angali, Agios Georgios, Vardia, Livadaki, Hochlidia, Katergo may be hard to pronounce now, but when you swim at one of these spots, you will never forget them. The island also offers an underwater paradise for scuba divers. 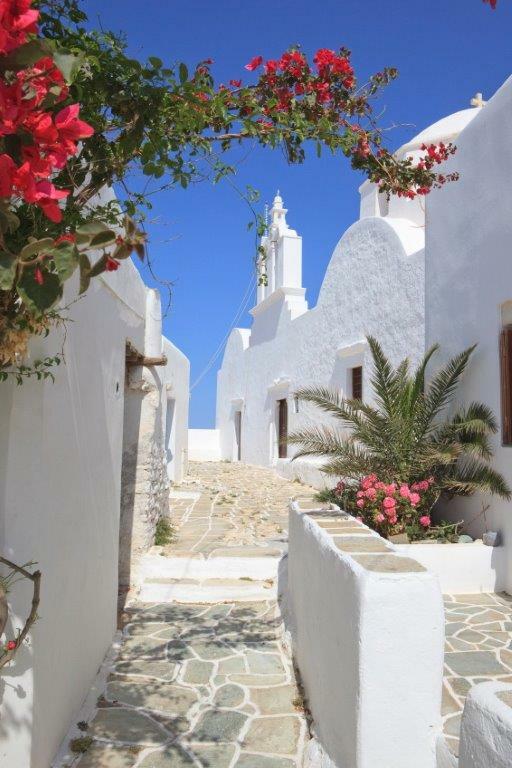 Ano Meria, the island’s other village besides Hora and Karavostassi, is a spread out village at the quiet rural end of the island. This village is scarcely populated with 350 residents and still keeps its traditions and heritage. No visit to Ano Meria village is ever complete without a visit to the splendid Folk Museum. It looks like the quintessential cottage house, consisting of the principal house, the oven, cellar as well as the winepress and a miniature vineyard. Look out for the quaint restaurants tucked into side-streets and taste delicious local dishes. For a tiny island, with a surface area of about 12 square miles, Folegandros is proud of its few luxury and boutique hotels. Its night-life is vibrant with bars and don’t forget to sip the rakomelo, a smooth local drink, made smoother, with a view. ** CNN.com ranking of the ‘seven most beautiful villages in Europe’, November 2013.